DSK Hyosung, one of India’s most celebrated players in the premium superbike segment has announced 100 limited edition Aquila 250 motorcycles in three stylish and eye-catching colour options. The special edition cruiser bikes will be available in Matte Green, Carbon Black, and Desert Brown; available across all DSK Hyosung dealerships. Adding to the quality of the premium offering, customers can also finance their DSK Hyosung superbikes with attractive zero percent interest loan schemes* (terms & conditions applied). Aquila 250 is a stylish cruiser bike showcasing a 4-stroke, V-twin, 249cc DOHC engine. Equipped with front telescopic suspension and hydraulic shock absorbers at the rear, the cruiser bike comes with a fuel capacity of 14 litres – ensuring long rides with less fuel stops. The superior bike that banks on performance and style has witnessed an overwhelming response from the cruiser biking enthusiasts across the country. The DSK Hyosung Aquila 250 has been a high-demand cruiser in the sub-500cc market segment. In order to mark its success, we are proud to announce 100 limited edition units of the Aquila 250 which will be available in three trendy colours including matte green, carbon black and desert brown. We have partnered with various financial institutions to provide interest free loans for all the motorcycles on offer in the DSK Hyosung line-up. 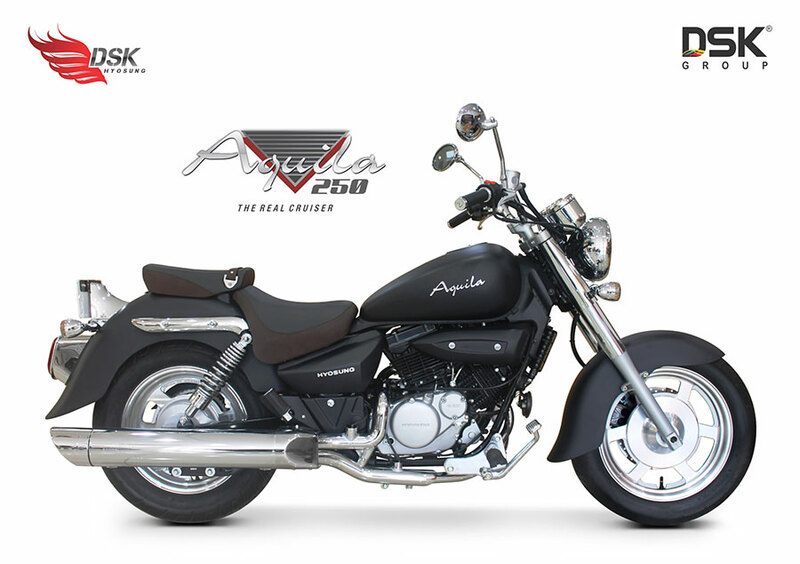 The DSK Hyosung Aquila 250 is also available in three shades of blue, black, and red.